It’s been many years since I first visited Iguazú Falls. Back then, I could wander along unmarked trails to the water’s edge and haul myself over rock formations to swim across natural pools to reach small cascades. Due the sheer weight of visitor numbers, the Iguazú experience has gradually changed to one that’s tightly controlled, highly regimented and commercialised. With the Argentine and Brazilian national parks – which feature as their centrepiece the 275 falls that tumble over a 3km wide precipice that spans the Iguazú River – now attracting well over a million visitors each year, its hardly surprising that rigid restrictions have been introduced. To help protect the environment, low-emission buses and trains ferry visitors from the parks’ entrances to visitors’ centres. From there, you follow paved pathways to the various lookout points. Running almost counter to such protective measures, the parks’ authorities have granted concessions to companies that offer environmentally questionable attractions: the near constant buzz of helicopters hovering above the falls is not only annoying to human ears, but also disturbs birdlife, while the high-powered inflatable boats that take “adventure” tourists to the foot of the falls interfere with spawning fish. Though Iguazú sometimes feels more like a theme park than a wonder of nature, the falls and the forest backdrop remain, without a doubt, a magnificent sight. And as long as you avoid the New Year and Easter periods, the parks are so impressive that rarely does one feel completely oppressed by fellow visitors. Still, when visiting Iguazú, I’ve always made a point of seeking out attractions beyond the national parks. One such place is located in neither Argentina nor Brazil, but in Paraguay: the Monumento Científico Moisés Bertoni, what must surely count as one of the most surprising parks and museum complexes in South America. 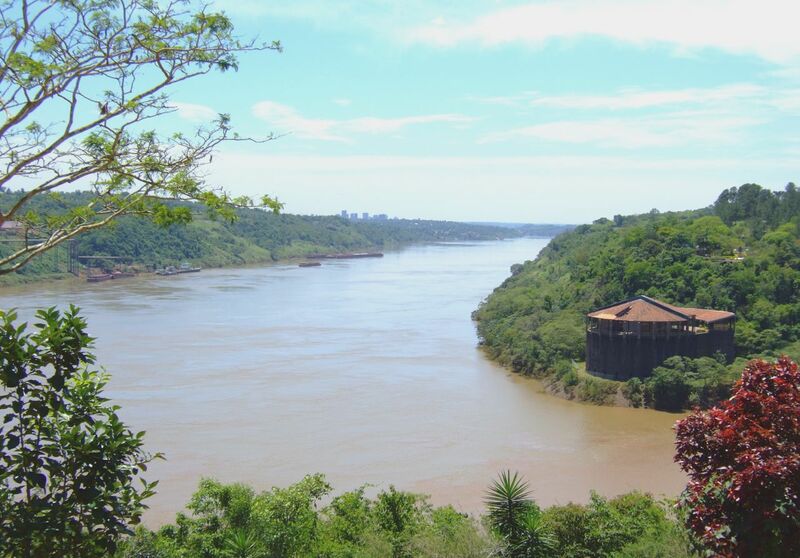 View from Argentina towards Brazil (top right) and Paraguay (top left) at the confluence of the Iguazú and Paraná rivers. The skyline of Ciudad del Este, the largest of the so-called “Triple Frontiers” border cities, is visible in the distance. 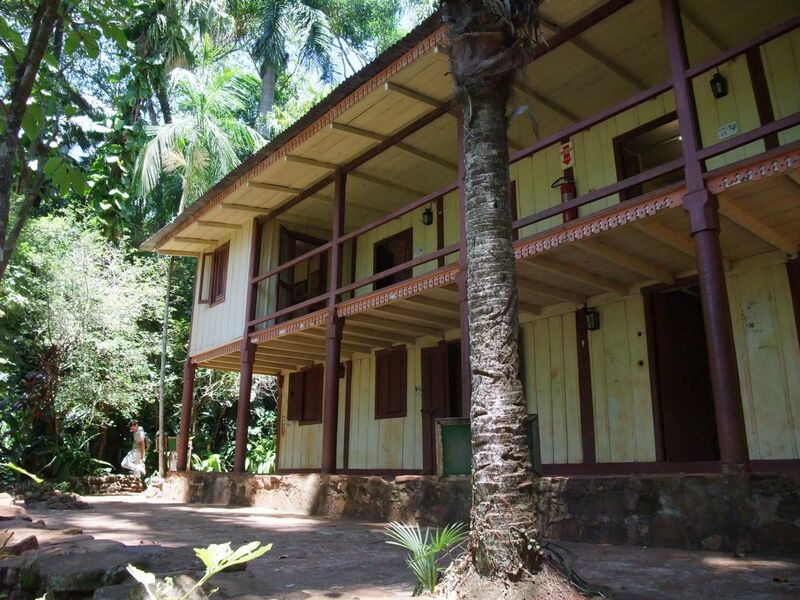 Puerto Bertoni, as this site is usually called, was the home, farm and scientific research facility of the Swiss naturalist Mosè Giacomo Bertoni – or Moisés Santiago Bertoni, as he became known in his adopted Paraguay. Born in 1857 in the largely Italian-speaking Swiss canton of Ticino, Moisés studied law and natural sciences at universities in Geneva and Zurich. In 1884, he moved with his wife (Eugenia), their children, his mother and 40 other Swiss emigrants, to the subtropical forests of Misiones, in northeast Argentina, with the aim of establishing a farming colony based on anarchist ideals. After a few frustrating years encamped in Misiones without the expected government support and struggling against the hostility of local landowners, Moisés and his growing family moved to Paraguay. There, in 1895, he received a 12,500-hectare land grant to establish the Colonia Guilllermo Tell – the William Tell Colony, named after the 14th century Swiss folk hero. Moisés would spend of most of the rest his life there, dedicating himself to the study of the region’s ethnography and history and – especially – botany, zoology, meteorology. The Bertoni family supported themselves (and Moisés’s research) by selling firewood, producing tobacco, corn and bananas, and experimenting with the cultivation of a range of indigenous fruits and other plants. Moisés was interested in the interrelationship of birds and insects in the nature balance, applied biological methods to his agricultural practices and sought to encourage locals from abandoning their traditional – and highly destructive slash-and-burn farming practices. Commercially, the family’s isolated farm was an utter failure, with its crops lacking much of a market and, in any case, regularly being wiped out by frosts and insects. Unfortunately for Moisés, although he is credited for being the first scientist to describe the local Stevia rebaudiana plant (Kaa-he-e, or “sweet herb”), it took over a century for stevia to be accepted as an alternative, natural, sweetener. Will sugar always be more advantageous than Kaa-he-e? We cannot suppose this. The superiority of sugar as an energetic food will not be contested, but this does not stop our plant from being stronger as a sweetener. As well as financial problems, health issues also dogged Moisés and members of his family and they were often struck down by tropical diseases. Moisés died in 1929, at the age of 72, in the nearby Brazilian town of Foz do Iguaçu, following a particularly virulent attack of malaria. 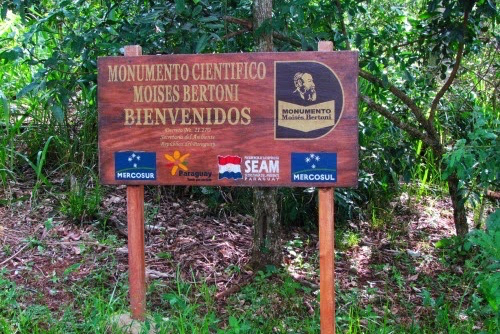 Today the Bertoni family’s home and Moisés’ research facilities are preserved as the Monumento Científico Moisés Bertoni on the remaining 199-hectares of the former Colonia Guilllermo Tell. 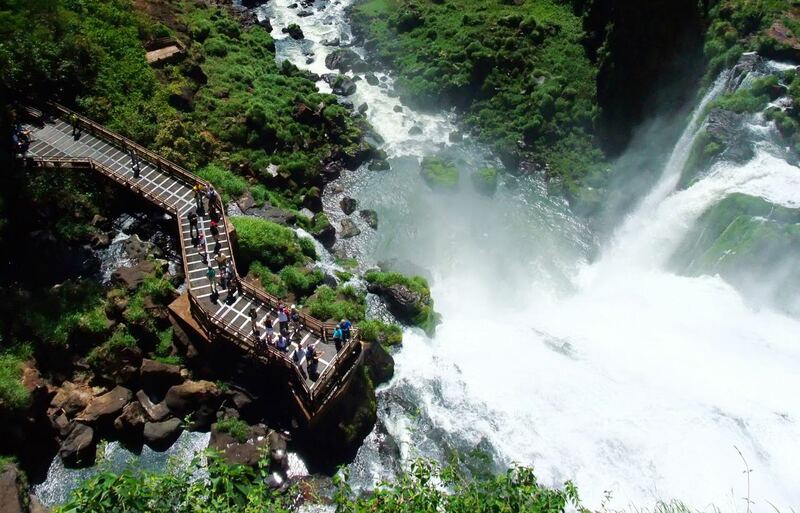 The site receives a trickle of visitors, mainly groups of Paraguayan school students, but also some foreigners who are visiting Iguazú Falls. From Brazil, Puerto Bertoni can be reached by crossing the Puente de la Amistad (the Friendship Bridge) that links the Brazilian city of Foz do Iguaçu with Paraguay’s Ciudad del Este, then travelling some 25 kilometres south by road. A much easier, pleasanter and faster means of reaching the site is by boat, with tourist departures from Foz do Iguaçu’s Iate Clube (Yacht Club). The boat travels along the Iguazú River until it reaches the confluence of the Paraná River, where it heads south, sailing downstream between Argentina and Paraguay. Within an hour of leaving Brazil, the boat pulls ashore at Puerto Bertoni. If you expect port facilities, as the name suggests, you’ll be wrong. There aren’t any buildings at this riverside spot, nor a wharf or even a sign identifying the location as being Puerto Bertoni. Puerto Bertoni – the house is just about visible, to the right of the clearing. Moisés Bertoni’s former home and offices just behind the small clearing. The house remains structurally remarkably sound. During recent restoration work, the bulk of Moisés’s collection has been transferred, for safekeeping, to Asunción, the Paraguayan capital. Even so, the items that are on display offer a strong sense of Moisés’s remarkable productivity. There are specimen vessels of various shapes, colours and sizes (some of which contain snakes and other creatures preserved in formaldehyde), weighing and measuring equipment, a printing press (most of Moisés’s copious research findings were self-published here) and books, pamphlets and images that have somehow survived the ravages of time, heat and humidity. The Bertoni family’s home and Moisés’ research station. Though towards the end of his life Moisés appeared to feel defeated by lack of funding and the effects of the climate, the isolation of his research centre at least offered his collection some protection from being completely dispersed. Bills that I cannot pay, misery for my family that hurts me so much, only one peon for the vegetable garden and the manioc field, the forest invading everywhere… And the tourists come to see this ruin, and to see a museum and collections that are being lost because of the insects….44 years of work! As well as offering insights into Moisés Bertoni’s work, the Monumento Científico provides a sanctuary to descendants of the scientist’s employees – some of the region’s indigenous inhabitants. As a farmer and as a scientist, Bertoni would have achieved nothing had it not been for the labour and local insights provided by the indigenous Mbayá people. Though Moisés Bertoni clearly benefitted from the Mbaya’s knowledge and skills, they were also afforded with a degree of protection from more ruthless outsiders who were exploiting the surrounding forestland. Today, about ten Mbayá families – around seventy people – eke out a living on the property controlled by the Monumento Científico. Though far from being a self-sufficient community, they grow cassava, corn and other basic crops for their own use and produce carved wood figures of animals, flutes and beaded necklaces to sell to passing tourists. The Mbayá of Puerto Bertoni are considered one of the most culturally intact people of the Guaraní ethnic group that is spread across a vast area of south-central South America and are amongst the last links the pre-colonization time. Survival always tries to convey an accurate picture of tribal people, as they are now. If we publish an image that might otherwise convey a false impression, where practical we will tell the viewer when it was taken. We will not knowingly use images which make tribal people seem more ‘traditional’ than is really the case, or which are otherwise atypical of their appearance or behaviour, unless we explain our purpose in doing so or this is obvious from the context. This article is just excellent. And Bertoni’s story reads like a Conrad novel — the William Tell colony lost in the jungle, the family and farm gradually disappearing, an immigrant’s research site becoming a haven for indigenous people. Really enjoyed it. Thank you, Robert, for your kind and thoughtful comment. My impression is that Bertoni both romanticised the Mbayá people and their culture while, as a man of his time, didn’t question his exploitation of them. When the scientific colony finally fell apart, many Mbayá fled across the Paraná River to Argentina, so brutal was their treatment by the new wave of Paraguayan and immigrant settlers. Thanks, Mili! 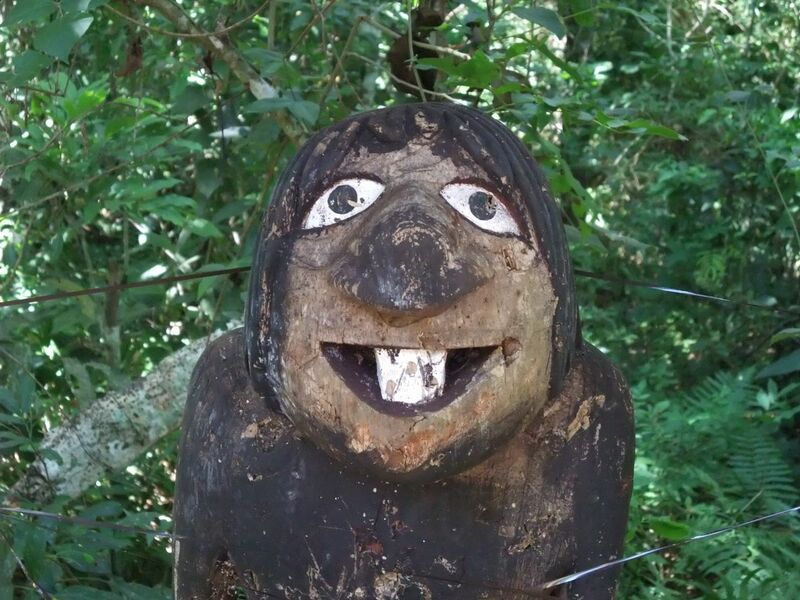 Culturally, Paraguay is a very strange country…. 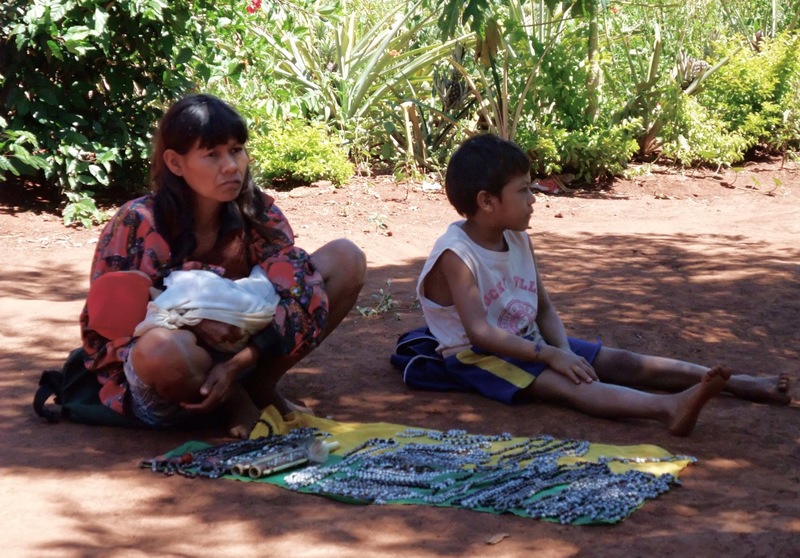 While the Guarani is an official (and almost universally spoken) language of the country, the “pure” indigenous population is even more marginalised and abused than just about anywhere else in Latin America. And there’s a long history of immigrant communities settling there – most have ended in failure, yet some survive, even prosper, to this day. Fascinating stuff, Oliver – thank you. Puts me in mind a bit of WH Hudson, whose Far Away and Long Ago, although largely pampas-based, evokes some of the naturalist’s fascination with that part of the world in that period. Robert’s reference above to Conrad above is pertinent also, not least since Hudson, WS Blunt and Conrad were mates. Another member of the group was RB Cunninghame Graham, whose ‘A Vanished Arcadia’ in roughly the same period (published 1901) connects with the political utopianism – back as far as the Jesuit Reductions, on through Morris’ News from Nowhere, and even on into Cunninghame Graham’s own foundational work in the British Labour Party and then the Scottish Nationalist Party. Perhaps a bit too tangential, but it might not be entirely irrelevant that recently deceased nonagenarian US peace activist and Jesuit priest Dan Berrigan took inspiration from the Paraguayan Reductions for much of his civil rights activity in the 1960s and beyond, leading to his arrest and imprisonment as one of the Catonsville Nine in 1968. So Misiones and Paraguay seem to have progressive political pedigree that transcends geographical and cultural borders. Perhaps less laudably, Berrigan had a significant hand (and a cameo role) in the Puttnam/Joffe Iguazu-located film, The Mission. Thanks, Nick, for all your comments! Yes, there are parallels with the Jesuit reductions but I understand that Bertoni was drawn to – and wanted to maintain – what he believed was the purity of Mbayá culture. As for your wonderful experience of the onion smugglers, I remember in 1989 and again in the early 1990s looking down towards the Iguaçu River (from Brazil) and seeing women transporting their goods. I guess that hereabouts the Brazilian federal police had more pressing issues – cocaine and electronic items being transhipped through Paraguay – to deal with….though, to set an example, I guess there must have been the occasional crackdown on onions! Really enjoyed the article. The story sounds familiar – is there a movie about the Bertoni family? Thanks for liking my blog posts although in comparison, mine seem very ‘light’. We will see the falls from the Argentinian side next week before returning home. Nothing like travel to make one want to know the history of a place or country. I’m glad you enjoyed the article. As for your blog posts, they offer wonderful insights into Paraguay, a country that is usually (and I guess understandably) completely overlooked. I’m sure that you’ll enjoy the Argentine side of Iguazú! Thank you, Monica, for your kind comment. Yes, there is much information that is missing – I just hope that I did not write anything that is actually wrong! There are many questions that I would like to ask you about your family – your family’s collective “memory” of the migration and Paraguayan experience and what eventually became of subsequent generations of the Bertoni family. To start, did your grandfather (and/or great-grandfather) travel with Moisés from Switzerland to Paraguay?